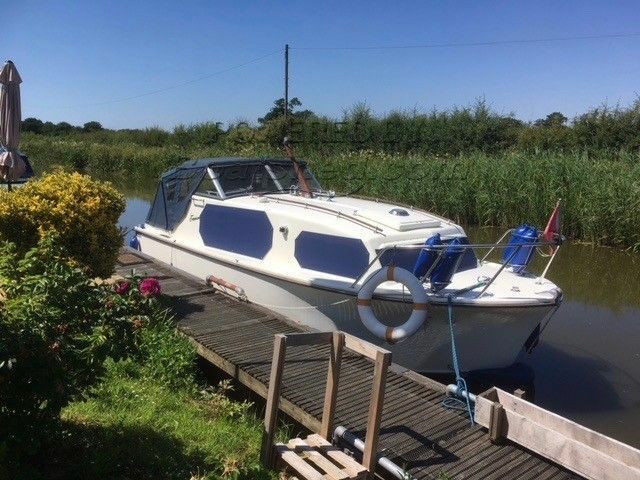 This is a lovely example of a well maintained and cherished Classic Freeman 23 MK3 which also benefits from a very nice farm mooring with all new decking which is available to the new owner if they want it. Apart from the garden furniture and storage boxes there is also a generator, mower and strimmer available by separate negotiation. The mooring costs around £500 a year and there is a private car park but there is no electric or water. The boat had a good hull survey in August 2017 and was antifouled at the same time. She has a BSC 11/2/2021. The owners have had a hot water calorifier fitted recently also. Inside the boat is in great condition with high varnish wood finish, curtains, good upholstery and cabin heating. As you come down into the saloon you have the kitchen on the starboard side with sink, new cooker and cupboard storage. On the port side is the dinette which drops down into a double bed and there is a wall mounted cocktail cabinet aft of the table. Going forward you have the heads on the starboard side and a wardrobe on the port side and the forward seating area which also acts as a double bed or two singles. The interior lights have long lasting LED bulbs fitted which reduces the battery load. This Freeman 23 Mark 3 has been personally photographed and viewed by Helen of Boatshed Lancashire. Click here for contact details.